A couple weeks back I ordered a slightly used lens off eBay and it finally arrived this week! 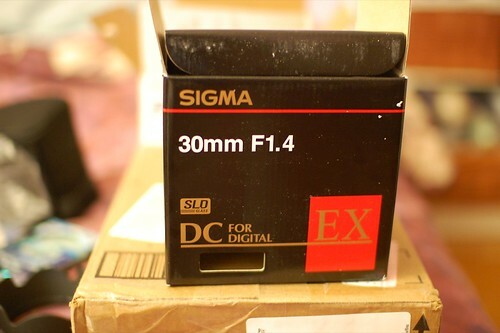 It’s a Sigma 30mm f/1.4 (as I’m sure you can read). While I do like my 50mm 1.8 Nikon lens a lot, I’m just not fast enough with my manual focus to take good photos of say, moving objects (I can handle yarn and stuff that doesn’t move!). The Nikon body that I have (the D40) doesn’t have a focusing motor in the body, which is why it’s so small and light – but it means that lenses which aren’t marked AF-S (or HSM with Sigma) won’t autofocus. Like I said, I can deal with it for still subjects, but it’s hard for people and such! And pretty impossible for taking a self-portrait with (for my Flickr 365 project). So enter the Sigma lens. I LOVE IT. The only downside is that it’s a bit heavy (430 g, that’s nearly a pound) but I’m sure my arms can get used to it. Or else. And in addition to the new (to me) lens, I got a great Christmas gift from my best friend’s family – an SB-400 speedlight flash! I haven’t used it yet because I need to dig up some batteries, but it’ll force me to learn how to use flash properly. Most of the time I cringe when I see someone take a photo with flash (particularly with point and shoot cameras) but this one can be angled up to the ceiling for more natural light. Mmmm, this lens is awesome! 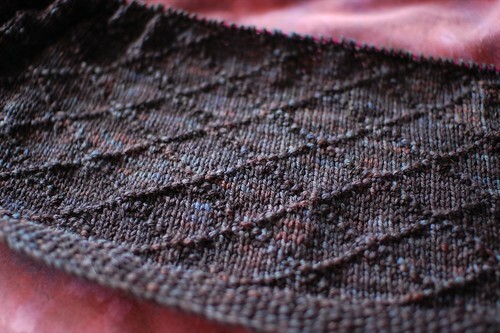 Anyway, my Lucy redux (knit in Dream in Color Classy in Black Parade) is coming along, but rather slowly. Now that all the Christmas knitting is done I ought to be able to push it out a little bit. I do want to cast on for a sleeve so that I have something in straight stockinette, which should be easy to get done! I have Canon macro 60mm, and … I love it, love it, love it :) Cause, it’s not for just macro photos, but for people faces …..
Best wishes for New Year ! The sweater looks really good. A year ago I considered Dream in Color a little too pricy, but it is such a good yarn that I keep looking for more of it! Oooh, your new Lucy is going to be really nice. Have a Happy New Year! such an awesome lens! 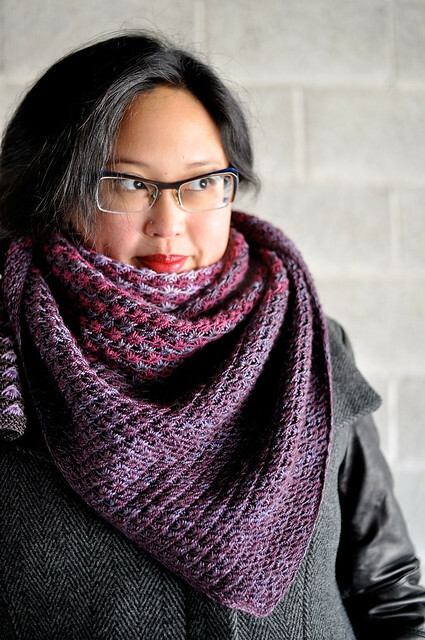 i can’t to see the pics that come from it :) and DIC classy is such a great yarn for that pattern! oooooh, yum.